If you're looking for the best bang for your buck coilover system, BC Racing coilovers are the way to go. 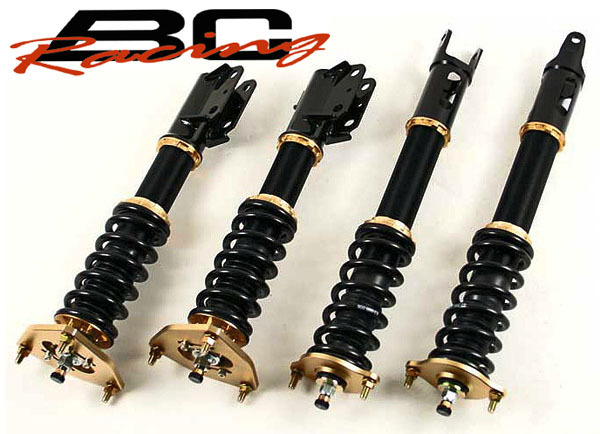 Perhaps the most popular coilover system in the aftermarket world is the BC BR Series coilover kit. The BR series kit is ideal for drivers who have a daily driven car but are wanting more performance without sacrificing to much ride quality. Each BR Series coilover have 30 way damping adjustments that make it easy for drivers to change the compression of their vehicle. The BR series coilover also makes it easy to adjust the ride height of your vehicle with their patented lower locking rings. If your looking for an even smoother and less harsh ride, here at Circuit Motorsports we provide a Swift spring upgrade to several of the BC BR series coilovers. We termed our custom kits as the BR Plus Series Coilovers! The Swift spring are made from a material called H5S.TW, which is a custom material designed by Swift to help improve your coilovers ride quality. Circuit Motorsports is one of BC Racing’s Largest Authorized U.S. Dealers, we have years of experience with BC Racing kits and we are available to help you with any questions or to give suggestions on a custom setup. If you desire a custom kit with different spring-rates we can accommodate you!